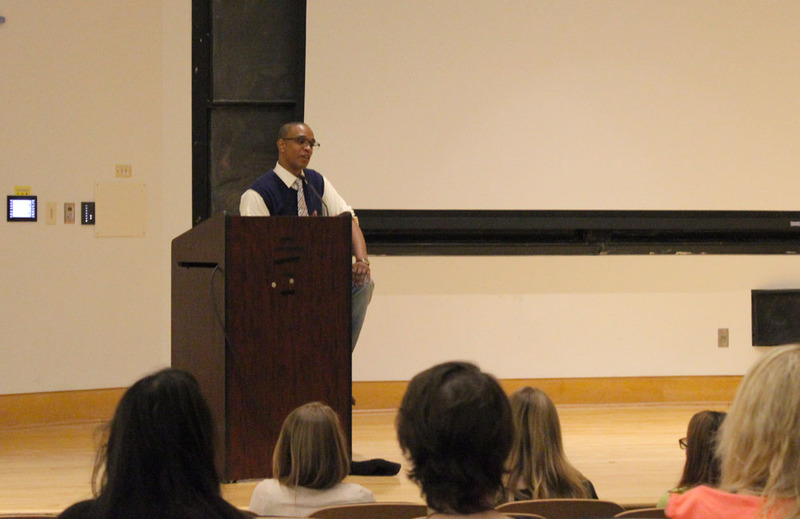 Active Minds, a nonprofit organization that empowers students to increase awareness of mental health on college campuses, sponsored a visit from speaker Jordan Burnham May 20 to speak about his experience with depression and attempted suicide as a part of Mental Health Awareness Week in Mitchell Auditorium. At age 18, Burnham attempted to take his own life by jumping from a nine-story building after suffering with depression and bipolar disorder. Today, he travels the country sharing his story and working to encourage students to seek help with mental issues, speak up to prevent stigma and not remain silent. Burnham believes the words of the heart to be stronger than the voices inside the head. Burnham began by describing his experience as a middle schooler in Pittsburgh, Pa., where he was ridiculed for the way he dressed and spoke. He was accused of being an African American who acted too white. To cope with the emotional distress of bullying, Burnham exerted his energy into sports, nurtured his sense of humor, and enjoyed telling jokes and meeting new people. He also relied on his older sister Tara to talk with him when he needed comfort. When Tara went away to college and he lost her support, Burnham weakened. When his father was offered a job as athletic director at Upper Merion High School in Montgomery County, Pa., Burnham left Pittsburgh to attend Upper Merion. In his new school, Burnham was teased again for similar reasons, but his sister was not there for support this time. Elected class president his freshman year, Burnham began to feel pressured to please and impress his peers. He and his friends turned to drinking in order to relax. In ninth grade, Burnham was diagnosed with depression, and he learned the difference between feeling depressed and having depression. In 10th grade, after failing his driver’s test for a third time, Burnham lost his temper and yelled at his father, alarming his parents, who were not used to seeing such an angry side of him. His mother decided to take him to a therapist. Today, Burnham can advise that finding the right therapist is key. It is necessary to feel comfortable around your doctor in order for the relationship to work. Burnham began contemplating how the people in his life might be affected if he took his life. One day at the beginning of his senior year of high school, Burnham’s parents found a bag of liquor in the trunk of his car. Their disappointment shattered him. Ashamed of himself, Burnham jumped nine stories from an open window in his home. After five days in a coma, he awoke with vertebrate injuries and no memory of his jump. To this day, he does not remember the moments leading up to his leap. Senior biology major Samantha John found this shocking. “When he talked about being suicidal and when he would think about going through with it — I didn’t know that was an impulse. The fact that he didn’t even think about it before he did it is very scary,” John said. Burnham cited his nurses as instrumental in easing his experience in the hospital and later throughout physical therapy. The nurses let him know that they were there for him if he needed to talk. After a period of recovery, Burnham attended his senior prom in a wheel chair and graduated with a walker. Sleep deprivation, substance abuse and anxiety are what Burnham claims to be the greatest causes of mental illness among college students today. According to Burnham, 60 percent of college students qualify as being sleep-deprived. Students turn to drugs and alcohol to relieve stress and symptoms of depression. Alcohol also relieves social anxiety. During his junior year of high school, Burnham learned a valuable lesson while being treated in a mental hospital. “We can never choose the bad things that happen to us in our lives, but we can choose how we cope with them,” he said. Friends and loved ones of the mentally ill can be instrumental in helping them cope. According to Burnham, it is important to identify mental illness as it’s seen. Burnham said people often choose to ignore the signs of symptoms in a friend and mentioned the case of young girls cutting themselves. People may brush this self-harm off as a cry for attention, when it is a behavior of mental illness. Burnham also mentioned the role of religion in coping with mental illness. This marks the second annual Mental Health Awareness Week sponsored by Active Minds. Throughout the week, other activities shined the spotlight on coping with stress and mental illness. On May 19, Water Balloon Stress Relief was held on Lancaster Walk. Students could write something that was stressing them out on a balloon and then throw it at a brick wall. Active Minds President and junior psychology major Jessica Rafalko hopes that these festivities have helped ease end-of-spring-term stress. “We’re kind of vulnerable during finals, so it’s nice to kind of have people talking about mental health. Then you’re able to take a step back and realize that we’re all kind of struggling a little bit,” Rafalko said. Active Minds started at Drexel in May 2013. With over 400 chapters nationwide, the organization aims to foster comfortable environments where students can engage in serious conversations about personal issues with trustful peers. Active Minds also sponsored Puppy Palooza during fall and winter terms. In February, it held a panel discussion during National Eating Disorder Awareness Week.